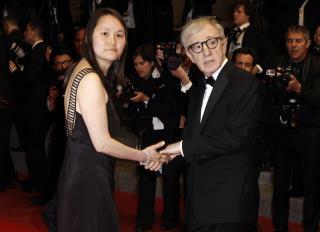 (Newser) – A California woman says she was Woody Allen's secret teenage lover—and is telling her story of adoration, disillusion, and threesomes with Woody and Mia Farrow. Babi Christina Engelhardt was apparently just 16 when she dropped a note at Allen's restaurant table in 1976 with her phone number: "Since you've signed enough autographs, here's mine!" Responding to his call, she began an affair at his Fifth Avenue penthouse but played by the 41-year-old's rules: no talk about his work and no meeting outside his place. "Knowing he was a director, I didn't argue," she tells the Hollywood Reporter. "I was coming from a place of devotion." Yet she was shocked four years later to learn he was dating Mia Farrow, who joined Allen and Engelhardt for a "handful" of threesomes. Devoted to risk of finding out, sure. You always leave the person who made love for you. Except for Norman Bates; he took her with him in every possible way.